DSSSB Clerk Recruitment: DSSSB is a reputed exam conducted every year by Delhi Subordinate Service Selection Board. It invited application in various fields such as Clerk,TGT, PGT, Teaching Posts, Manager, Deputy Manager, Junior Engineer, Section Engineer etc. DSSSB has released official notification for DSSSB 2018-19 Exam for the post of Teachers (PGT, TGT and other). You can check the detailed official notification by clicking on the link mentioned below. Around 835 vacancies will be declared for selecting candidates to these posts through DSSSB Exam. Aspirants can apply for DSSSB Clerk once the application date is released you can apply by visiting official website. 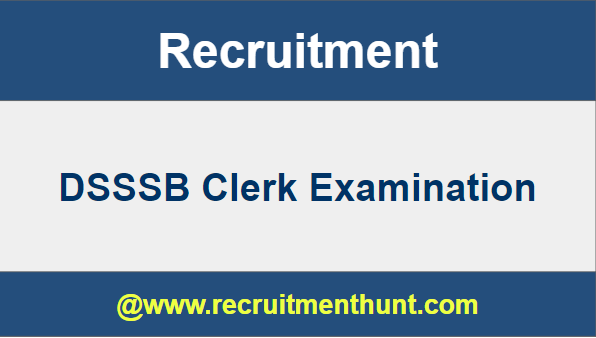 Here we are going to provide you DSSSB Clerk Recruitment 2019 Notification, DSSSB Clerk Important Dates, DSSSB Clerk Vacancy Details and how to apply for DSSSB Recruitment. For more information regarding DSSSB follow our website www.recruitmenthunt.com. The DSSSB Board has released 1074 Vacancies for Lower Division Clerk Post. So, Contenders who are interested have applied for DSSB Group 4 Recruitment Notification. Now it’s time for preparation. Many candidates are searching for DSSSB Clerk Syllabus on many websites. So, we advise Aspirants stop wasting time by searching and check DSSB Lower Division Clerk Syllabus here in detail. Here, we will also provide DSSSB Clerk Exam Pattern in the following sections. Education Qualification 12th class pass or equivalent qualification from a recognized Board or university. A typing speed of 35 w.p.m. in English typing or 30 w.p.m. in Hindi on Computer (35 w.p.m. and 30 w.p.m. correspond to 10500 KDPH/9000 KDPH on an average of 5 key depressions for each word). Selection Process: Selection of candidates will be made on the basis of One Tier and Two Tier Examination scheme and Skill Test. Application Fee:General Candidates have to pay Rs. 100 through SBI Bank Challan or using Net-banking/Credit or Debit Card. Other candidates don’t have to pay any fee. Choose the Latest DSSSB Clerk Notification 2018 on the Home Page. Download DSSSB Clerk and read the eligibility criteria. Fill the DSSSB Clerk Application Form. Make the Payment of Application Fee as per category. Finally, candidates can download DSSSB Clerk Recruitment Notification here. Applicants can make their preparation easier by following DSSSB Clerk Previous Year Question Paper. Download DSSSB Clerk Exam Pattern along with DSSSB Clerk Previous Year Papers through this article. Also, for more job updates subscribe and stay tuned to our website RecruitmentHunt.